In 2015, Mary Karatsu received a pin for 25 years of service from JANM Board Governor Chip Mamiya (left) and President/CEO Greg Kimura. 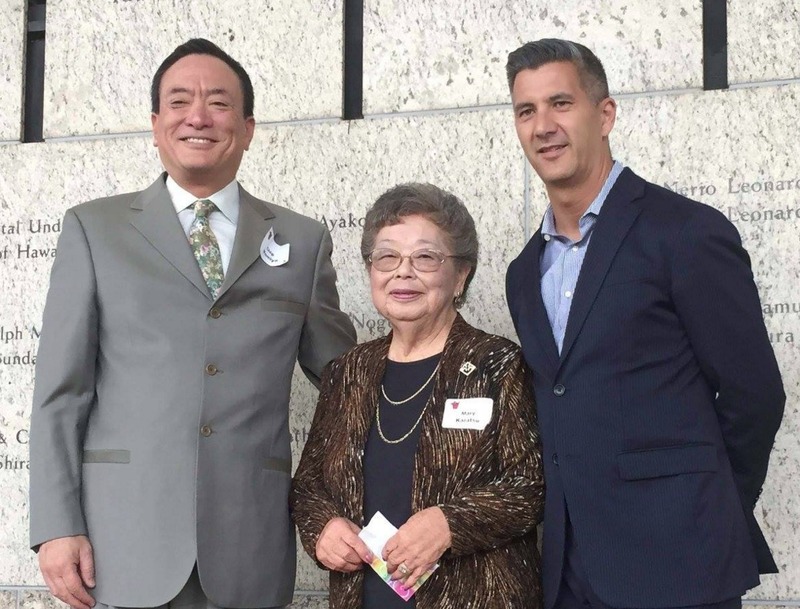 The Japanese American National Museum mourns the passing of longtime museum volunteer Mary Karatsu, who died May 17 at the age of 94. After the bombing of Pearl Harbor, Mary — then 17 years old — and her older sister moved to New York and avoided the forced confinement of Japanese Americans in America’s concentration camps. She worked for her uncle, who had arranged an apartment for them, and later attended business school. Meanwhile, her parents and younger siblings were incarcerated at Heart Mountain in Wyoming. At one point, Mary visited them and took her younger brother and sister back to New York with her. She married George Karatsu in 1950. During the war, he left the Amache concentration camp in Colorado and also went to New York. While there, he was drafted into the U.S. Army and served in Company G of the 442nd Regimental Combat Team. Mary’s volunteer work at JANM started in 1989, as did George’s. She led the volunteer committees that spearheaded publication of two volumes of the “Cooking with Love” cookbook, sales of which supported the museum; twice chaired the All Museum Talent Showcase; and named the “Volunteerly Speaking” newsletter for JANM volunteers. She volunteered in several different areas of the museum, including the Hirasaki National Resource Center and visitor services. She was perhaps best known, though, for her fundraising efforts for JANM. For the Phase I campaign to bring the museum to fruition in the former Nishi Hongwanji Buddhist Temple, Karatsu headed up one of the regional committees. It raised $150,000 — 50 percent more than its established goal. For the Phase II campaign to fund the Pavilion building and JANM’s expansion, Mary helped secure a $1 million donation from the Weingart Foundation, where she had worked part-time after retiring in 1993 from a 28-year career at the YMCA. Mary and George Karatsu received JANM’s first Museum Family Spirit Award in 1996. In 1999, Mary received the Miki Tanimura Outstanding Volunteer Award. Though her health prevented her from regularly volunteering beginning in December 2016, volunteers, staff, and museum supporters were thrilled to see her at the most recent JANM Gala Dinner on April 21, two days before her 94th birthday. Mary is survived by daughter Karen Karatsu Kennedy, sons Robert (Vinita) Karatsu and Wayne Karatsu, four grandchildren, two great-grandchildren, sisters Sachi Kaneshiro and Dorothy Kuwaye, brother Paul (Kay) Tamaki, and many nieces, nephews, and other relatives. Her husband George died in 2002.